WARNING: If you were a child of the 90s, this post is about to blow your mind. I honestly have no idea what I was searching for on Pinterest when I came across a random board called, "Childhood Memories." I bookmarked it, thinking it'd make great blog material one day. That day has come. 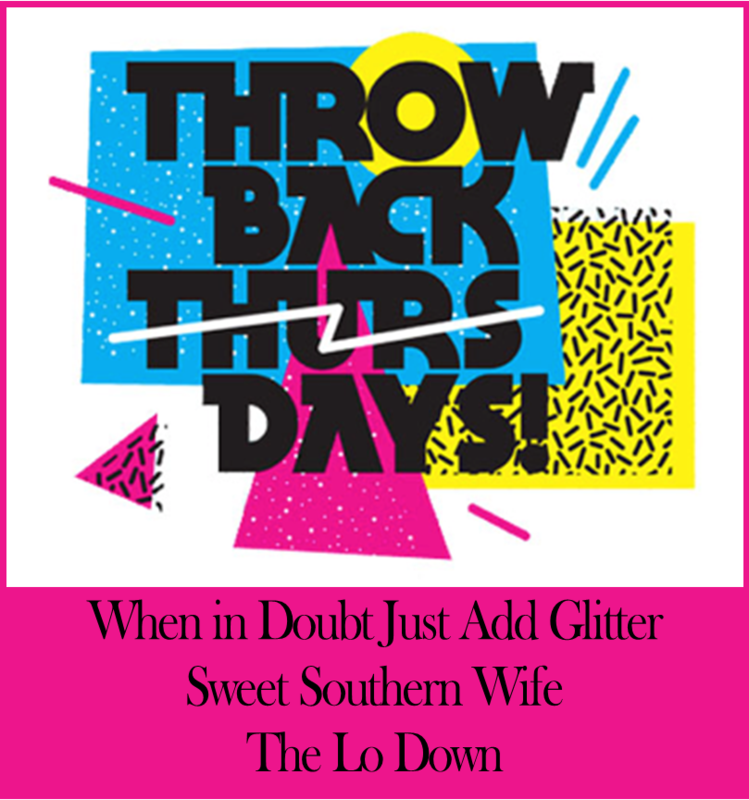 I found a link-up with a few lovely ladies to honor Throwback Thursday, and if this ain't a throwback, I don't know what is. That's right: Jesus. I mean, who does that? 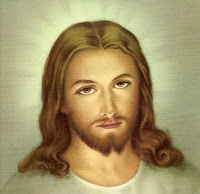 Don't get me wrong—I'm not saying Jesus isn't cool or even attractive, but I think that even the most religious of people would NOT put freakin' JESUS on her top five. Anyway. Moving on to other childhood memories. Anyone else feeling nostalgic looking at these? 1. Jellies! I lived in these during summer. 2. Playing Oregon Trail on an OLD SCHOOL computer. I did this every day after school. 3. SHARK BITES! Best fruit snacks ever. 4. Amelia Bedelia. I read this out loud to my "classroom" frequently. 5. Dream Phone. We played ever.single.sleepover. 6. Candy Lipstick. Delicious and practical. 7. Giant parachute. It was the only thing I looked forward to in gym glass. 8. McDonald's Cookies. 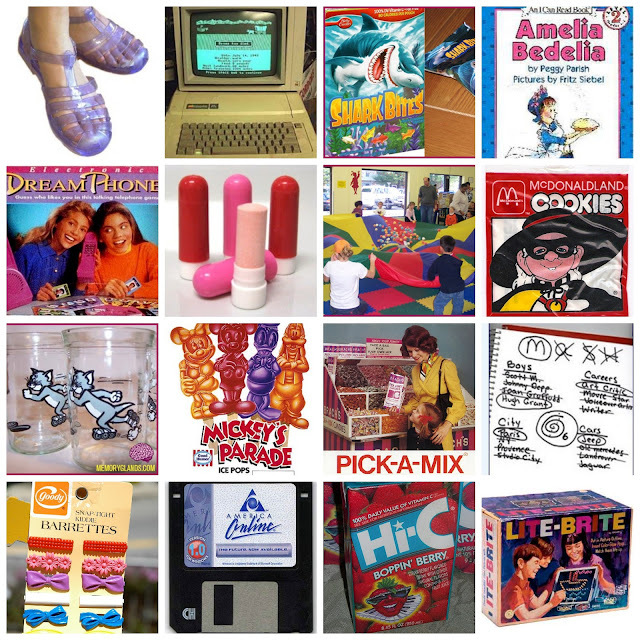 What happened to these, and those cool toys that were hamburgers+transformers? 9. Welch's Jelly Jars. Pretty sure we only bought the jelly so we could have the glass! 10. Mickey's Parade Ice Pops. I'm sure they tasted the same as most popsicles but I remember them being so much better. 11. Brach's Pick-A-Mix. Remember this at the grocery store? My favorite was these red, round hard candies that had gum in them. I called them "Gumdingers." 12. MASH. You will marry Brad, have 3 kids, and live in a shack in Paris. 13. Goody Barrettes. We've come such a long way since the evolution of the sock bun. 14. AOL + Computer Discs. Our kids will never know the lengths we went to be connected or "save." 15. Hi-C Boppin' Berry. Was like crack. I would give up wine for that. Well, that's probably a lie. 16. Lite Brite. A choking hazard, but a beautiful one. I mean, I could do this all day, but I have to go back to work.